The world of Kregen circles the twin suns of Antares, far distant from the skies of Earth. Yet Kregen is the ground on which the Earthman Dray Prescot must stand and fight for all he holds dear. For Prescot is the unwilling battle arm of the mysterious Star Lords who contend for that planet with the powerful Savanti. Yet Prescot's ambitions are his own, for he has inherited the remnant of a shattered empire and must fight to bring hope and freedom to all its peoples. By his side stands his princess, Delia of the Blue Mountains, and a band of stalwart companions of many races and species. But arrayed against him are flying armadas, armed hordes, the wizardry of a super scientist, and, most shocking of all, the fury and steel claws of his own daughter, Dayra! A Life for Kregen is the nineteenth book in the epic fifty-two book saga of Dray Prescot of Earth and of Kregen by Kenneth Bulmer, writing as Alan Burt Akers, and begins a new cycle of adventures. 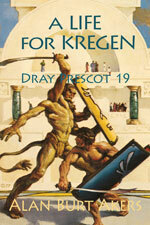 The series continues with A Sword for Kregen.